Tokyo: Asked how US-China talks on trade tariffs affect US beef exports to China, US Meat Export Federation (USMEF) international program assistant Vice-President Greg Hanes used the "chicken-and-egg thing" metaphor. Chinese "buyers don’t want to commit to specific volumes, because the price is high, and (US) producers don’t want to want to commit to producing for China, because they don’t know if the buyers are going to be there," Hanes said. Following a 2003 ban on US beef due to bovine spongiform encephalopathy (BSE) or mad cow disease, China has allowed boneless US beef from cattle under 30 months back in since last June. But the country requires imported meat to be hormone- and beta-agonist-free, come from China-approved plants and have traceability. That drives up production costs, and consequently, leads to higher retail prices. Prices will get even higher if the threat of a 25% tariff hike on imports from the US becomes reality. China has threatened higher tariffs in retaliation to the US raising tariffs on imports from China. "Buyers don’t want to commit ready-to-sell beef at an expensive price," and US beef to China "has the potential to being even more expensive in the future," Hanes said. Hanes led an USMEF-organized marketing trip for a group of 11 representatives of US beef associations and one academic to China on May 6-9, and then went to Japan until May 12. Participants met with importers, and in the case of China, with online importers Alibaba and Womai.com. Despite the tense situation, Cattlemen’s Beef Board (CBB) CEO Scott Stuart said he witnessed a lot of excitement from Chinese importers for US beef. "We would like to see that beef get into their hands as soon as possible," Stuart said. While Japan is the leading volume and value market for US beef, it imposes the highest tariff rate (38.5%) of any major import market. Beef-exporting countries with trade agreements with Japan enjoy lower rates. 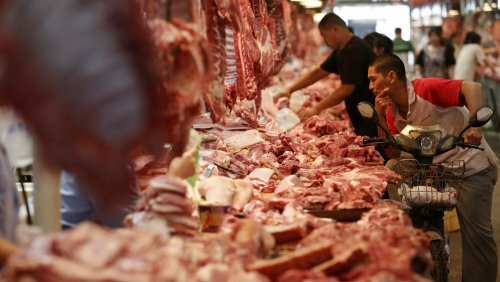 Once the Trans-Pacific Partnership agreement (TPP) among the 11 remaining countries is implemented, the U.S. will be the only major beef supplier to Japan still subject to quarterly safeguard mechanisms and higher tariff rates. The Trump administration pulled the US from TPP in 2017. Under the Japan-Australia Economic Partnership Agreement (JAEPA), which entered into force in 2015, Japan’s imports of Australian beef are currently subject to tariffs of 29.3% for chilled beef and 26.9% for the frozen meat. These rates are scheduled to fall to 23.5% by 2028 for chilled beef and 19.5% by 2031 for frozen product. Another important aspect of the JAEPA is that imports from Australia are no longer subject to Japan’s quarterly safeguard mechanisms, but rather are covered by country-specific annual safeguards, which are much less likely to be triggered. Japan’s economic partnership agreements with Mexico and Canada include tariff rate quotas, within which imports pay a reduced duty rate (currently at 26.5% for Canadian beef, and 30.8% for its Mexican rival), and are also excluded from quarterly safeguards. Whenever overall beef imports in a fiscal year quarter exceed by more than 17% import volumes in the same period of the previous year, tariffs rise to 50%. When excessive imports show up only in the final figures for the entire preceding year — which come out in late April — the higher tariffs strike only in May and June of the new fiscal year. The raise is applied separately to chilled and frozen beef. The tariff snapback was applied to the latter Aug. 1, 2017, affecting imports from the US and other countries with no trade deal with Japan. All participating beef suppliers serving Japan, including Australia, will see import tariffs drop to 9% over a period of 15 years, much lower than the 23.5% and 19.5% floors negotiated in Australia’s bilateral agreement. CBB member and Minnesota State Cattlemen’s Association past president Ted Reichmann, a cow-calf and feedlot operator in Villard, Minnesota, said he doesn’t think the CPTPP issue is hurting Japan interest in US beef at all. "But it is making our product less competitive," he said. CBB chairman Joan Ruskamp, who operates a feedlot with her husband in Dodge, Nebraska, said what the issue does do is create uncertainty. Foodservice managers cannot plan menus for a year when they don’t know what the price will be, Ruskamp said. "It diminishes our potential to export beef to this market," she said. Texas A&M university department of animal science associate professor Jason Cleere, a beef cattle specialist, said the US beef market suffers from a flattened consumption, but will experience record production this year. "With that, we will need to assure export markets," Cleere said. The Chinese market is really exciting, just because the population is so huge, Cleere said. "We need to get those consumers to eat US beef." Hanes said USMEF strives to build demand for US beef whatever the state of access to a market may be. "Whether we have good access or bad access, we’re still working to build demand and awareness, and get more product into the market."